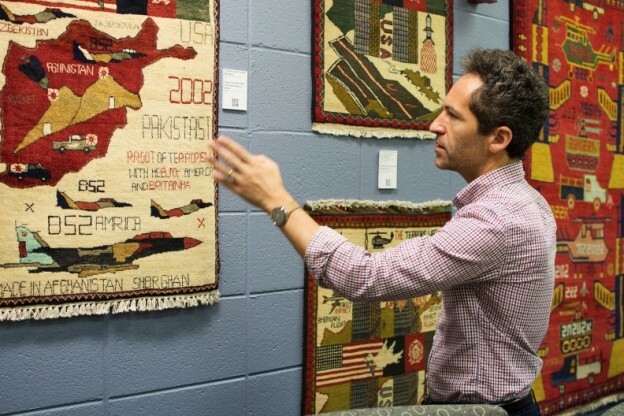 I sure hope you got a chance to check out those story-felt Afghan war rugs at Temple University’s Samuel L. Paley’s Library , room 303. 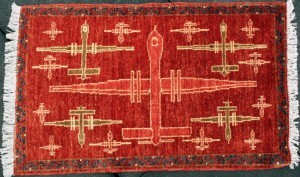 War rug art is fascinatingly educational friends! Temple University’s Samuel L. Paley Library, in room 309, is currently holding a Afghan war rug exhibition that contains 14 of my Afghan war rugs. These rugs tell stories and contain history which, ” helps contextualize a group of people that many Americans know very little about.” Theirs so much to be learned and talked about. Go check it out! This show has curated by Alicia Cunningham-Bryant and student assistant curators, Ilana Napoli, and Rachel Morin. This entry was posted in Afghan Women, Baluchi Patterns, Beautiful Picture, Exhibitions, General, Regular Rugs, Rug Images, Rug Structures, Tech is Beautiful, The War, The Weapons, The Weavers, Uncategorized and tagged 911, Afghan, America, Art, Art Amongst War, Art War, College, Culture, Curator, Diversity, Drexel, drone rugs, Dronerugs, History, Iraq, Message, PBS, Philly, public radio international, Rugs, Students, TCNJ, TempleU, TempleUniversity, UPENN, War Art, war rugs on March 18, 2016 by Kevin. The drone rug craze has maintained its drive. Public Radio International featured a story on the rugs, their background and growing popularity. There is a written story on PRI site, as well as the option hear the full radio interview. You can find a link to both below. Thank you to PRI for the interest! 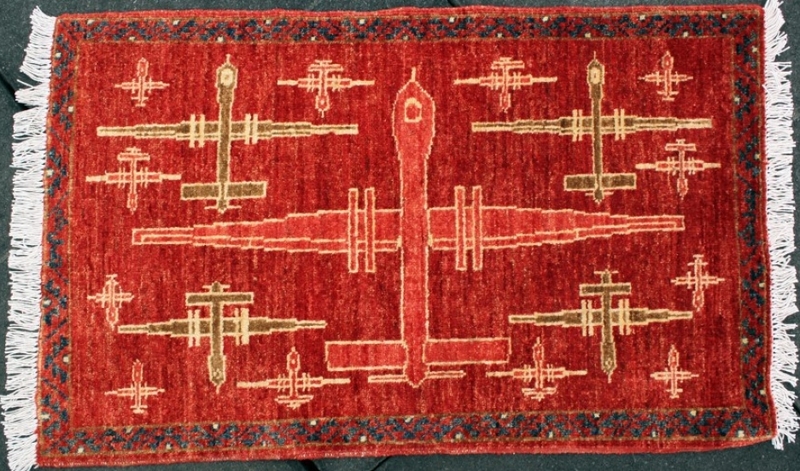 This entry was posted in Rug Images and tagged drone rugs, public radio international, war rugs on February 18, 2015 by Kevin. Today’s New York Times Metropolitan section has a story by Tammy La Gorce about the show ‘Art Amongst War’ at The College of New Jersey’s Art Gallery. The show is curated by Deborah Hutton, and it features an array of art made by Afghan artists including 5 war rugs loaned by warrug.com, including the one in Times’ story. The show includes fine paintings, beautiful needlework, historical and contemporary video, installation art and some beautiful and haunting photographs. This entry was posted in Exhibitions, Rug Images, The War, The Weavers, Uncategorized and tagged Afghan, Art Amongst War, TCNJ, war rugs on March 30, 2014 by Kevin.